Few amateur conductors can have been so fortunate as to start their conducting career with such a skilled and experienced string quartet, and it has been gratifying to retain quality section leaders throughout the group’s history. The diversity of technical ability in amateur orchestras is even greater than in a choir; yet, with clear leadership, enthusiasm and application, remarkable and even unique results can be obtained. A full orchestra gradually evolved. David, Arthur, Susan and Michael were central to this early development, and a number of other excellent musicians have taken on their role in subsequent years. 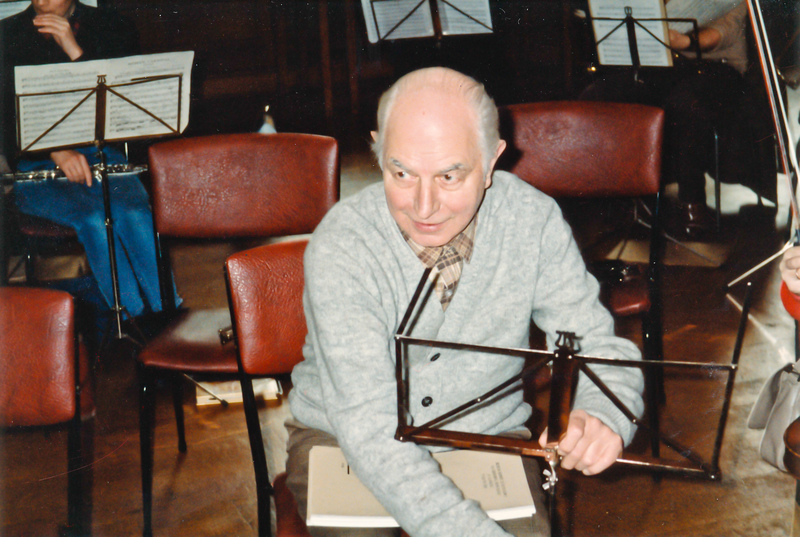 David remained leader of the orchestra until 1981. He gradually educated the conductor into his ways; it was a delight and privilege to communicate with his smile and masterful control. We have continued to have the pleasure of his company on a number of tours and occasional visits since. 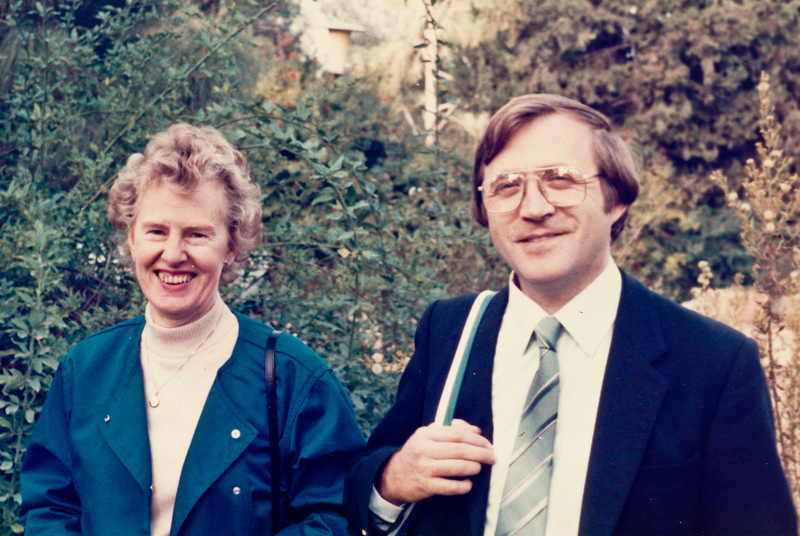 David introduced Margaret Banwell to the orchestra in the early 1980s and, as his professional commitments across the Midlands increased, Margaret took over as leader, also fixing and developing the string section. We extend an enormous “thanks” for what she has done for the orchestra over thirty years, being a pillar of strength, providing experience and wonderful skills in the concert hall, and also in rehearsal and behind the scenes. Cecily Mendelssohn and Evelyn Chadwick have looked after us when Margaret was away, and Eileen Bell has been deputy leader for much of our existence. Arthur was followed as leader of the seconds by Alice Smol, and in recent years by Rachelle Goldberg together with Ian Hall and Shenagh Franklin. Sue’s role in the violas was taken up by Bill Bott and, for twenty years, Harold Harriott, ably assisted by Isabel Smith, and more recently by Max Tonson Ward and Joy Tredinnick. Michael was followed in the cellos by Jenny Brown, Chris May, Helen Keene, Ruth East, ably supported by Riet Carmichael and Ben Field. Double bass players have provided a unique band. Norma De Marco filled this role admirably, as well as providing the spark that initiated our first tour. When she moved to the cellos we were fortunate in gaining the support of Adrian Warwick, a performer, enthusiast and stringed instrument maker extraordinaire. Other regulars have been Alistair Hume and Jan Kellerman. Wind players were initially those of the Gilbert and Sullivan Orchestra, particular thanks going to Richard Carver for fixing both orchestras, and to Jill Dean and her college friends. As with the strings, we have been fortunate subsequently in having a small group of excellent musicians providing us with great sounds and looking after their sections. In the flutes, Ruth Newman, supported by Liz Hewitt-Jones, for much of our existence; and in the early years, by Jean Finch and Nick Jackman; more recently by Ruth Underwood, Kate Walsh, with a long service medal to Liz. In the oboe section after Richard Carver, we had the delight of Adam Bager’s playing with Caroline Benwell, in later years Kathy Bucknill with Sophie Hewitt-Jones, and in recent times Twig Hall and Linda Hannaway. Jill Anderson not only took over the clarinet section, but also much of the orchestral management of many overseas tours. She was ably succeeded by Geoffiey Elkan; thanks also to Kay Julian, and currently to Barbara Wyllie and Tom Radice. Graham and Judith Knight looked after the basoon section for many years, this role now being expertly filled by Glyn Williams, supported by Philippa Bambach, Renate Wendel and Ann Moore (who we thank also for her programme writing). In the early years the horn section was provided by Tina Brain and her fellow students, Peter Gow playing occasional solos. A big “thank you” for the marvellous playing and fixing of Peter Kaldor in recent years and regular team of Peter Ramage, Alison Turley and for many years Joanne Thirske. An extensive number of trumpeters provided on and offstage support during our four decades of existence. Prime thanks are due to John Parker for his enormous efforts and enthusiasm, and to Jack Tebbit must go the section’s long term medal. Peter Reed did his fair share of fixing, William Spencer provided some marvellous obligato passages, and we will not forget Jackie Wyatt, Robin Woollams, John Smith. Welcome to Neville Young and Lottie, Frank Burgum and Paul Franklin. Although 19th century composers produced some great trombone lines, these were not accompanied by a lot of notes, and therefore we are grateful to the stalwarts who have sat patiently through so many of our concerts. John Carmichael, as well as being the foundation of the section, is also our official photographer; he has taken even more tour pictures than JSPL (and with different results, as witnessed by many photographs on this site). Other trombonists have included Richard Hudson, George Ramsden and Charles Mackworth-Young. The baseline started with Arthur Hawkes and passed on to Tom Uprichard and Tim Elsworth before Arthur returned. Tuba players are a breed apart and Steve Store was no exception, providing a memorable presence on many tours; John Webb, between making brass instruments, played trombone, tuba and euphonium. Tony George’s performances included a wonderful Tubby the Tuba. Our first timpanist was David Lake, but, regrettably, this stopped when his transport was involved in a car accident. Cynthia Mason, at home in so many orchestral roles, looked after the section for a number of years, while Fred shared a lifetime’s military band experience with us for two decades. Anne Morgan was an enormous support to Fred, JSPL and the whole group over this period. Valerie Hawkes sold us our original timpani, and is our current wonder lady. Concerto days provided at least eight soloists and many memorable moments each year, the majority of performers coming from within the orchestra. The quality of these playthroughs highlighted the standard that we have come to expect from the members of the orchestra. Organists have included David Bell at the Albert Hall, Nick Murdoch in the Saint-Saens Symphony and John Dickinson on many occasions, including a memorable Handel concerto in S Ignazio in Rome. Concerto days have witnessed many excellent pianists. Concert performances have been given by a number of members of the group, including medical students Cathy Byrne and Aileen Wang, together with John Gibson, Jill Bolland and Stephen King. Ian Gaukroger performed a Shostakovich concerto in the Albert Hall. Many wind and string concertos were also given concert performances by members of the orchestra; we thank Jack Rozman and Garcia for their violin concertos given in Merchant-Taylor’s Hall and St Paul’s respectively.